Bruce Lee is interesting. | Do. Be. Interesting. Home People Bruce Lee is interesting. 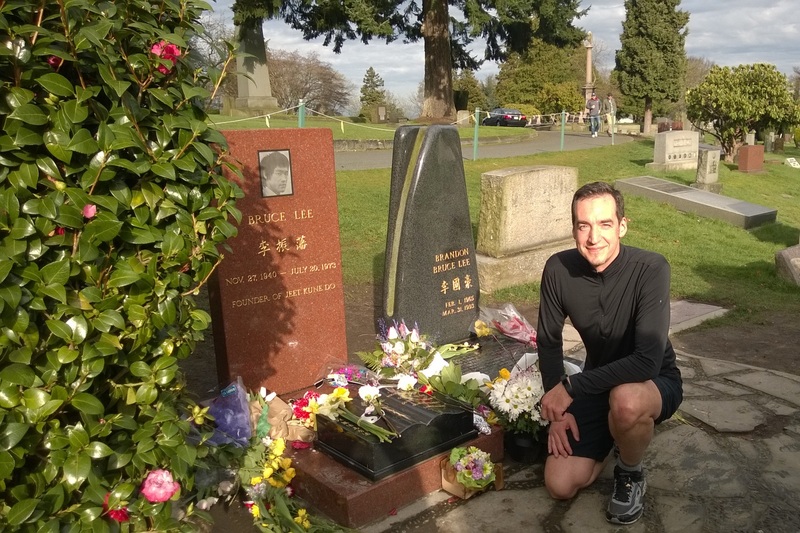 One of the many interesting things about the cemetery where I run is that it’s the resting place of Bruce Lee and his son Brandon. Their graves are at the very top of Capitol Hill, so I feel like just getting there is a real accomplishment and a tribute to the intense discipline and work ethic exhibited by Bruce during his lifetime. There are always fresh flowers on the graves, and usually some visitors as well. This time, I traded pictures with a young couple who was visiting. However, I realized afterward that I never asked anything about them or where they were from. That would have been so interesting, I’m sure! So, I’ve resolved to start taking more of an interest in learning about the people that cross my path. I can’t wait to have a story to post! Previous articleGuinness at Fados is not interesting. Next articleCrazy can be interesting, too.